I mentioned in a post or two back that we had a total of 6 hours to choose everything for our home. 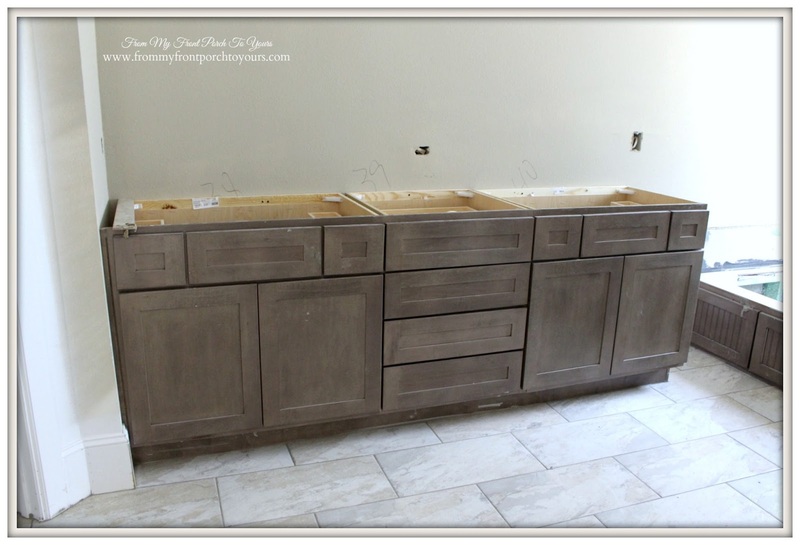 The kitchen was the most stressful for me so instead of focusing on it the first day we moved on to our bathrooms. The bathrooms came together very easily for me. 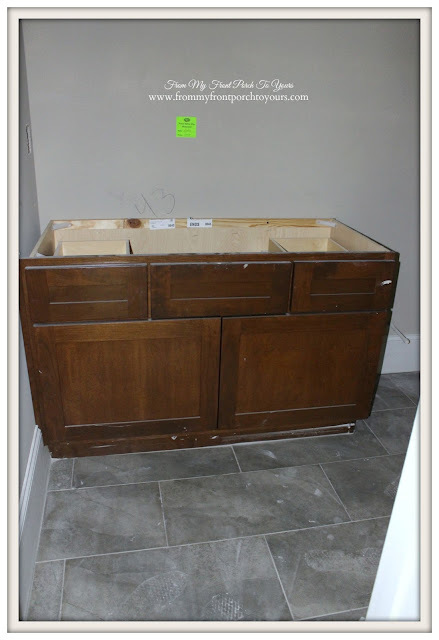 We chose shaker cabinets for our master bath. 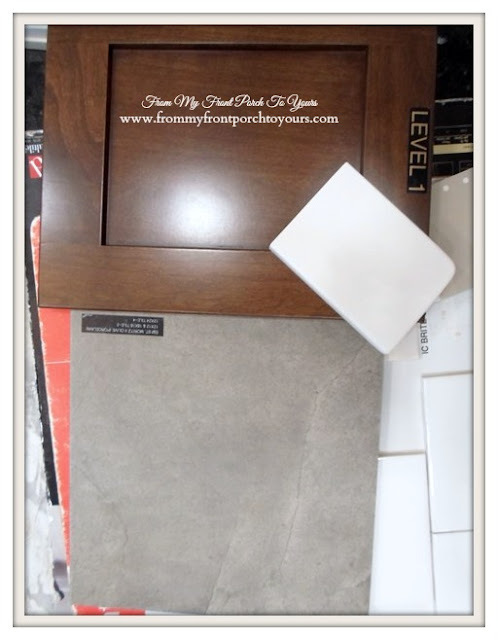 Mr. Front Porch fell in love with a wood tile for his shower and we picked out a pebble for the shower floor. The tile work has started and the cabinet has been installed. 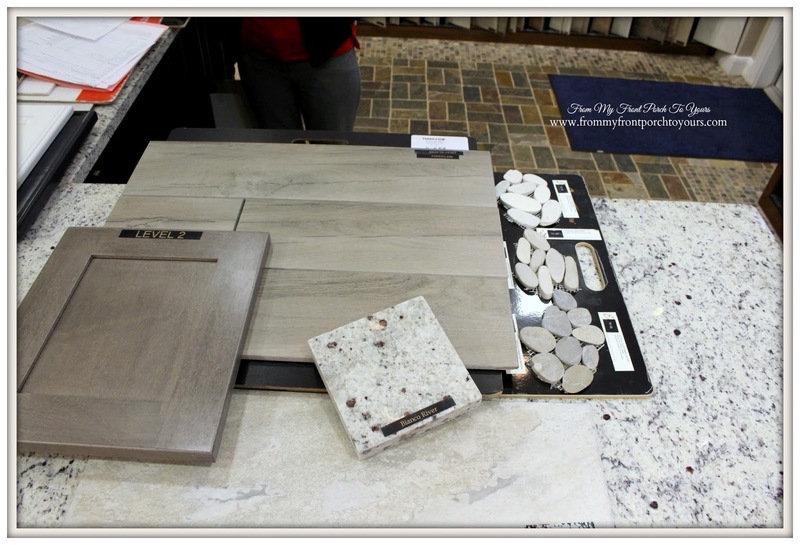 Our counter tops have not come in yet. I love the cabinets in here. They are called Driftwood and I had originally picked them as well for our kitchen but changed my mind. The wood tile still needs to be installed around the tub backsplash and the pebble shower floor. 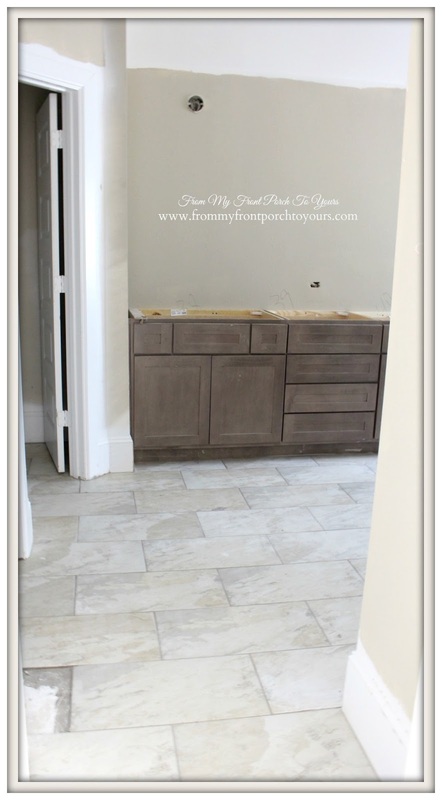 We had 4.5 baths at our last home and with this home I said good bye to cleaning 5 toilets! :) We now will just have 3 bathrooms. I had originally just wanted 2.5 but our Realtor told us for resale value...though we plan on being in the new house till the boys are out of college...that it would be better to have three full baths. We have two downstairs and one upstairs with the gameroom. 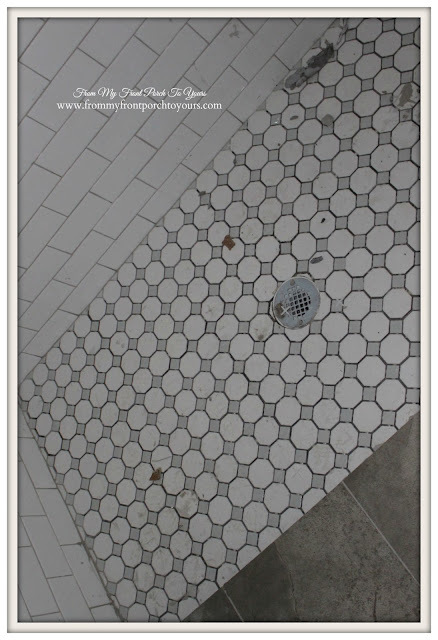 Since the secondary downstairs bath will be used by guests but also be our boys main bath I decide to go towards an industrial farmhouse theme. A little more masculine for the guys but still nice for our guests. 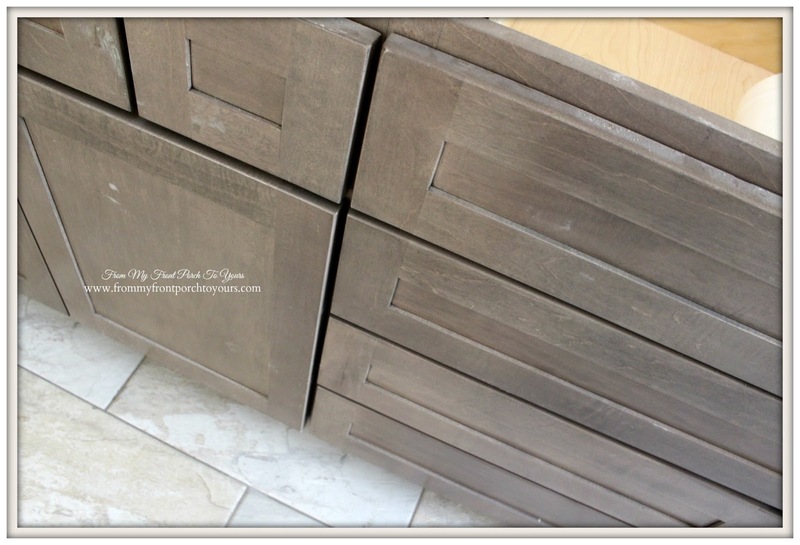 Wood shaker cabinets are a nice contrast to the concrete inspired tiles we chose. The boys have always used our master shower and never the tub/shower combo that was in their bath at the last house so we opted to do a walk in shower for them. Added bonus it will be better for the adults that will use this bathroom as well. We did do a shower/tub combo upstairs though. 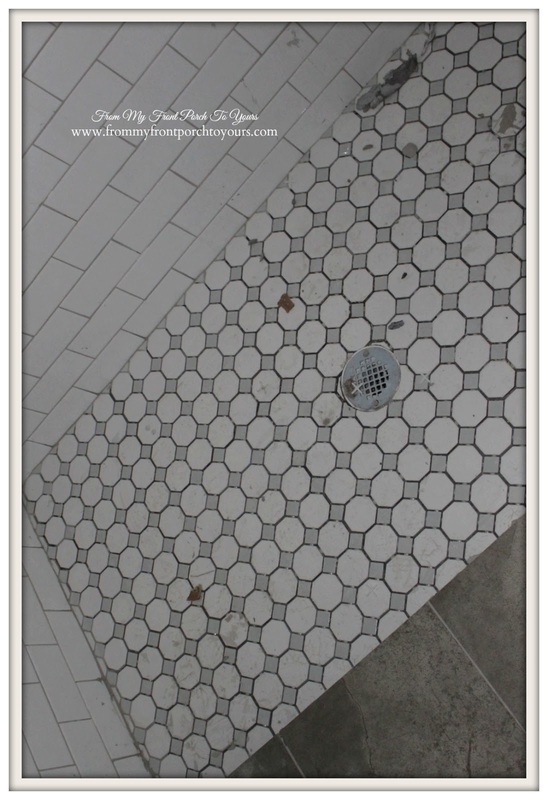 We chose vintage looking grey and white tile for the floor. We have the same thing but in black and white upstairs. 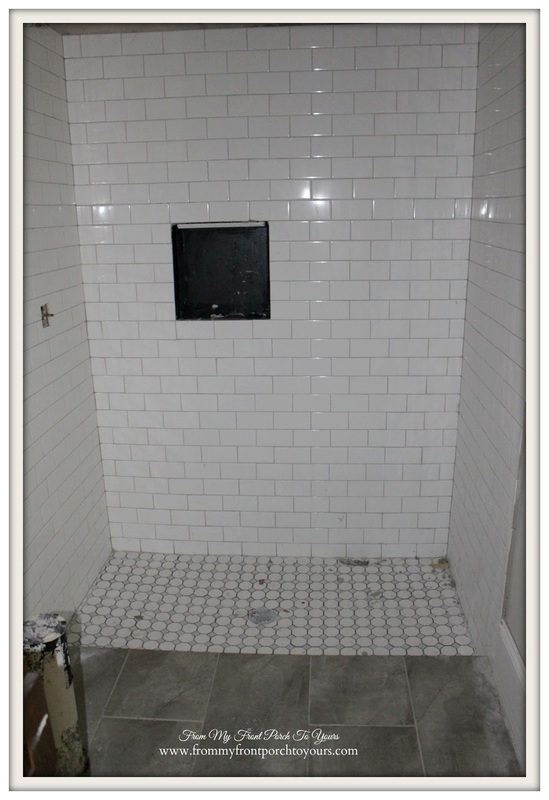 I can not wait to see what it all looks like once it is grouted. That is all that has been up at the house so far. Hoping to have more to share soon! Sharing at Savvy Southern Style & French Country Cottage. It is going to be beautiful, Pamela! Everything looks so great, Pamela! I had to laugh about the lesser number of baths. My son has five...ha ha! My kitchen cabinets are much like your bathroom ones, I wanted very simple, very farmhouse. Pics are up on my blog! Let me know what you think. It's all looking so good! I love your material choices. Oh Pamela how exciting. It is going to be so beautiful. Love all your choices. I love all your choices! 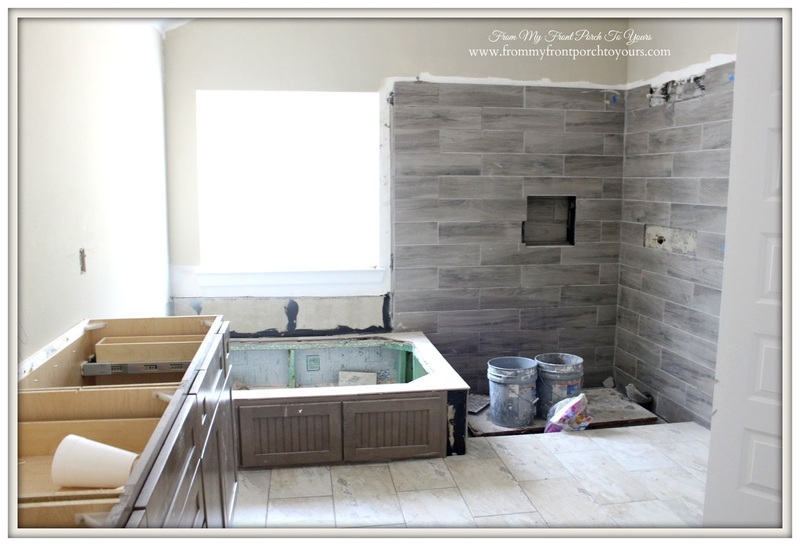 Your bathroom is going to be killer when it's all done. Can't wait to see it all come together!